Mix together the berries with the flour and the sugar in a bowl. Pour over pie crust* leaving a 1-inch border. Fold up the uncovered border over the edge of the fruit and pinch into pleats. Sprinkle the crust and fruit filling with 3 teaspoons of turbinado (or raw) sugar. Bake in preheated oven until crust is lightly browned, about 30 minutes, depending on your oven. A good rule of thumb is to check the galette at 20 minutes to see how well it’s coming along.. Serve warm or at room temperature. Top each piece with whipped cream, or a dollop of vanilla Greek yogurt. *For my pie crust recipe, click here. 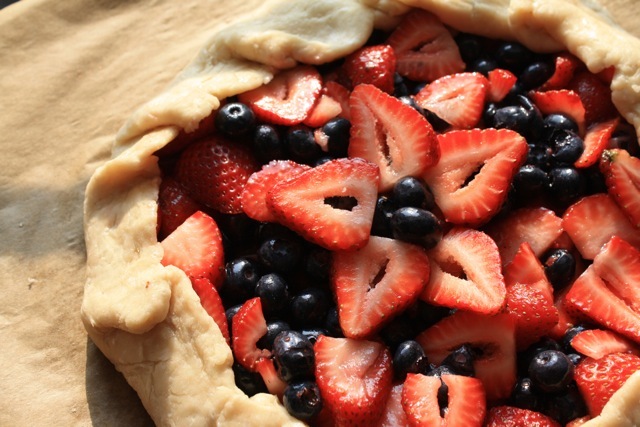 Making a pie crust yourself isn’t that hard, especially if you have a food processor. If you already make your own pie crust, I swear by my recipe using half butter and half Spectrum shortening (vegetarian and non-hydrogenated: skip the butter flavored one and go for the plain one in the blue and white container). Looks divine Chris! I’m going to make one this weekend. Cheers!